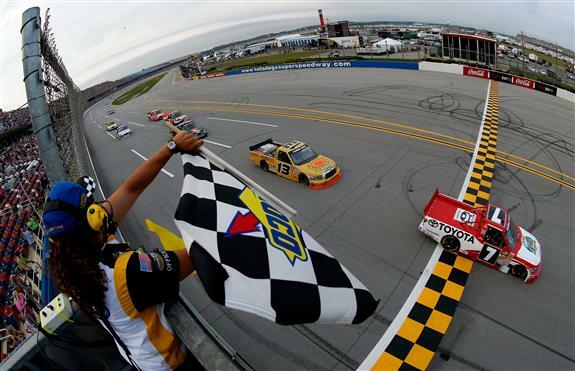 Kligerman takes the checkered flag at Talladega. Not long ago Parker Kligerman found himself without a ride. Today at Talladega Superspeedway Kligerman drove his No. 7 to the win in his first career victory in Red Horse Racing's 300th NCWTS start. Johnny Sauter, who started in 29th position, pushed Kligerman to the win as a caution came out on the final lap. Pole sitter Ty Dillon had a strong day leading 25 laps en route to a fourth place finish. Dillon maintains the points lead over James Buescher by only one point. The two points leaders teamed up in tandem late in the race hoping to take the lead, but were unable make the final push to the front. Buescher finished the race third. After the race he told reporters in the media center he doesn't yet have a deal for 2013. Kurt Busch, driving the No. 18 Dollar General Toyota for Kyle Busch Motorsports, was in the top five all day, teaming up with several drivers including Aric Almirola and Jason White. Almirola's truck was strong early in the event, but a stuck gear forced the team to the garage for a short time in order to make repairs. White, who is still looking for his first victory in the series, led 11 laps and had one of the strongest trucks in the race. Working with Busch early in the event, White was able to maintain a top five position until he got hung out on a restart. It was White and Kligerman who made a charge to the front putting the race winner in contention. White finished 20th after being involved in the last lap crash. Tom DeLoach, owner of Red Horse Racing, said about the win, "Not too shabby." DeLoach went on to call Kligerman's truck, "a magic truck" noting that it has won at Daytona twice including with John King in February.